If you make a left turn at LAX, you would not believe where you might find yourself. So there I was at Deerfield Beach with a bunch of DiverLinkers. 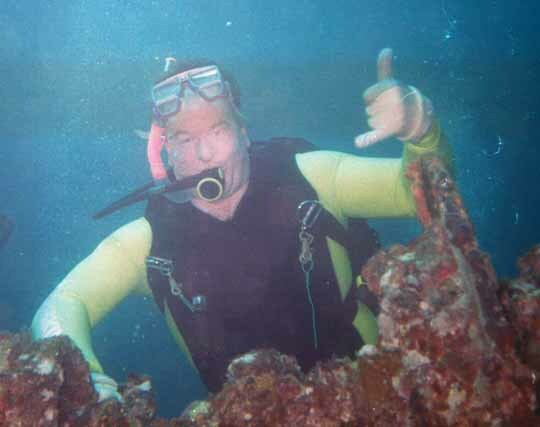 I was set upon by Augi, Michael, JoAnn, Walter, Marta, Chris and others who all insisted I had to go diving. What could I do? They even gave me a tank and weight belt. Hmmmmmmmm. I think it was 82 degrees or there abouts and I was comfortable in a lycra diveskin. We headed out a bit through the inland channels to the open ocean. It wasn't as exciting as the route out from Boynton Beach, but it got us out just offshore, into the Gulf Stream. I was supposed to go down to a reef with I think Michael, Walter and Augi. My gear was hard to get to and I wasn not perfectly composed, so I was the last one in, but I quickly caught up with them. As soon as we started across the reef, the other divers gave a start that meant "run" to fish, but to other divers it meant "look over here at what we found". This huge loggerhead turtle rose off from its resting place on the reef.. As Augi later said, it had a head the size of a basket ball. It was huge and I had never seen one before. It had a dull shell and did not have the striking pattern of green sea turtles. It sure was big though. Michael had an inspiration that we should cross to an inner band of reef. We all followed him in anticipation until we all got sick of crossing sand. ... There were some small parasol worms in the short red seaweeds that were so sensitive, that I had to wonder what their predator was. Moving within 18 inches of them, no matter how carefully, caused them to close. We finally corrected Michael's inspiration and reversed direction. 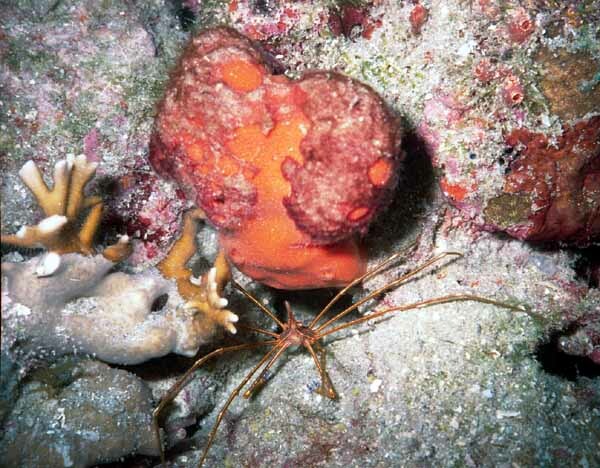 As we approached the reef again, Augi frantically signaled to me and I saw a stingray he was looking at. It was huge. I agree with Augi that it was the biggest I had ever seen. Looking at it close, it had scratches on it that looked like someone had scratched their initials on its back. I went charging after it and a close look showed they were not letters. The pictures didn't make it. We progressed along the side of the reef where it stuck up about 10 feet. There was a fair amount of fish and bottom growth to see. 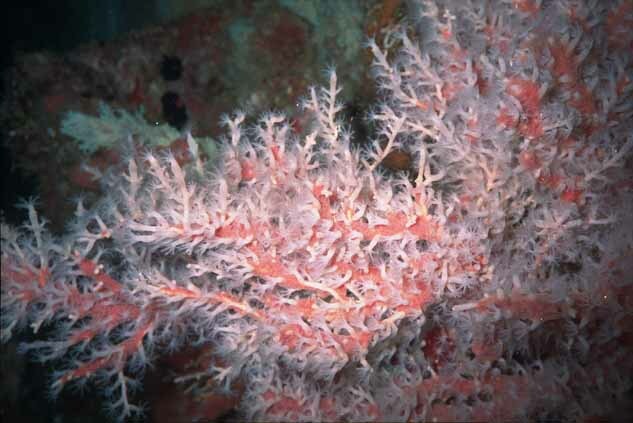 With all the red sponges and delicate sea whips sticking up, it gave meaning to the term coral garden. Michael and JoAnn were ahead of me were the reef had split and there was a lot of habitat. The area was thick with smaller fish of all kinds of colors. As they swam over the split, a large barracuda swam into it. I figured that if I positioned myself correctly, I could catch a shot of the barracuda as it came out of the crack. My positioning was perfect. Too bad I'm such a poor photographer. 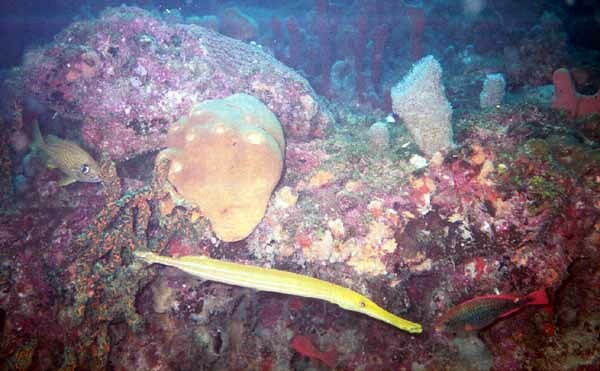 The dive continued through beautiful terrain with all the variety of sealife of the Florida reef. We headed up too soon. The interval was fun listening to dive stories, especially from the well dove, Skipper Jim. 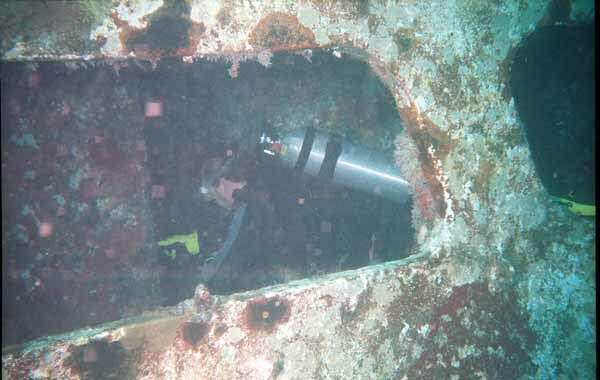 The next dive was to be on a wreck, the freighter Carribean United. Jim told us this was a haunted wreck, because when it ran aground in new Jersey, some illegal immagrants from China had died in the surf. Again I was late into the water, but I met the group as planned at the bow. There was a fair current to pay attention to. 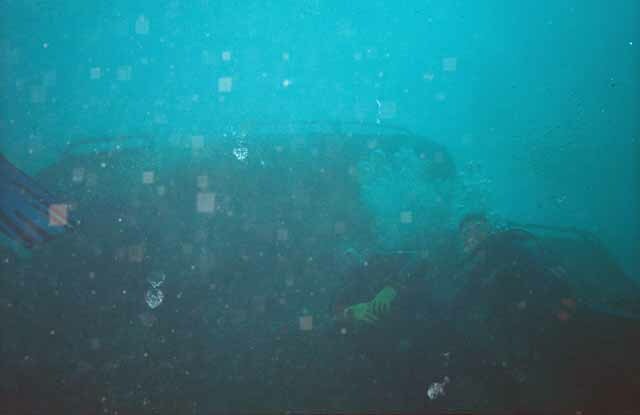 Visibility was excellent and the entire wreck was visible. We all started out cruising the corridors of the bow with its soft corals, but quickly went to the large hold that was most of the wreck. I dropped into the hold and saw a Midnight Parrot fish. I had to get a picture, but almost immediatly, Michael and other divers were trying to pull me away to something else I just had to see. I snapped some quick pictures and went to the back of the hold. 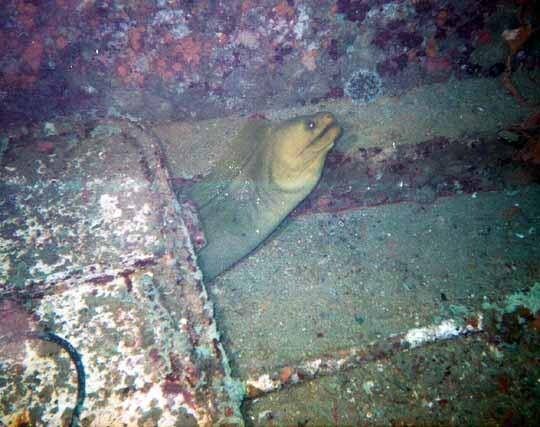 On the bottom there was a small door sized hatch cover with a mondo sized green moray under it. It didn't fit. Its head stuck out the front with a foot of its tail sticking out the back. It wasn't too agitated, but I think it wished it had a better hole with all these bubble blowers around. I took a few shots and then headed back into the hold for an unfruitful hunt for the parrotfish again. The hold was a very square hole about 80 feet long, 30 feet wide and 35 feet deep. While there was a fair current above, the water in the hold was completely calm. I was playing with my bouyancy. It was novel not having a wetsuit. Your bouyancy at depth was the same as at the surface. There was no wetsuit squeeze to adjust to. Just using the air in my lungs, I had no trouble moving down really fast and moving up as fast as I dared. Going down was fun. I have at least a gallon of lung, which is almost 8 pounds of seawater. Exhale and you can get dropping really fast. You can go up too, but there is always that pesky embolism risk to consider. I was checking my trim as well and found that it too was completely dependant on my lung volume. I still think that trim is usually vastly overrated, though I want to ask Ron a question about that. 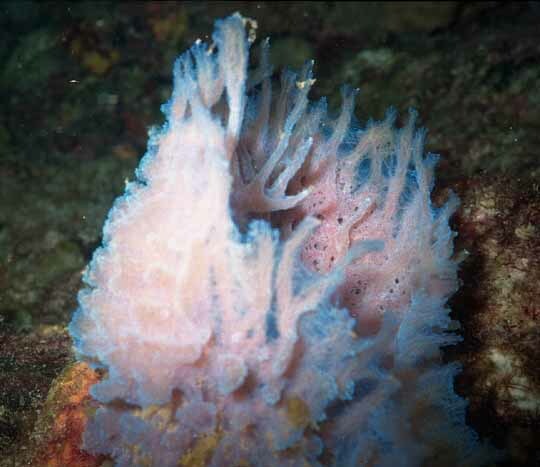 There was a lot of small stuff to see, including oysters, fish and the white soft corals. 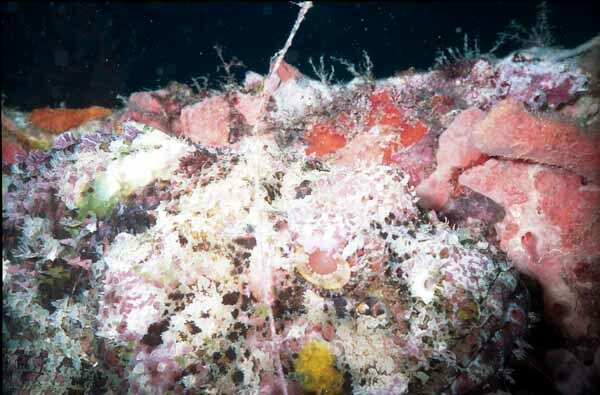 At the bottom of the boat were various sand critters and many hidden, encusted oysters. Up on the bow there was heavy loading gear including winches and hooks. I decided to be cute and exhale drop my way through the small hatch on the bow. I went zipping right through, down a ladder and almost landed on Michael. There were holes in the back of it to the bow, that he and JoAnn had come through. I went up again and continued exploring, then returned to the calm hold. Michael was quite engrosed with introducing himself to the moray, so what could I do. I gave his fin a tug. It was time to move on. There is a lot of interesting things at the stern to take a look at before rising into the current up the ascent line. On the way back in, it was OK with me that we didn't see any of the manatees that are in the area, but it was cool that the skipper was pointing out som big local iguanas on the shores of the channel. I'm more partial to reptiles than sea going elephants anyway. These 4 foot lizards looked very sassy indeed and probably were real good at whipping with those long tails. Jim said you pour beer over them on a hot barby for 4 hours. The DiverLink group then moved on from the docks to tasty if less adventurous foods at a nearby Mexican restraunt. It amazes me that this is the internet at its best where it can bring a community of divers together regardless of distance. It was great getting together with some of the the local Florida diving contingent that I had communicated with for so long, but had never met.